Hot Creek State Fish Hatchery is located near Mammoth Lakes Airport off U.S. 395. Hot Creek raises about 3 million trout each year for planting in the Sierra Nevada lakes and streams, and over 20 million eggs for other fish hatcheries throughout the state. 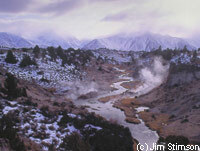 The warm springs of Hot Creek provide ideal temperatures for trout development. You may view the fish in long rearing ponds called raceways. Fish are raised here to plant in local waters and to provide eggs for other hatcheries. The hatchery is operated by the California Dept. of Fish and Game. The raceways are open for visitors to view fish.Get the details on breeding trout year round. Open daily to the public. Located near the Mammoth airport off Hwy. 395. Three miles south of Mammoth Junction and one mile east of US 395 is a California State fish hatchery. The warm springs of Hot Creek provide ideal temperatures for incubation of trout eggs and continual development of trout to planting size. Visiting hours are 8 a.m. to 4 p.m. No charge. The Mt Whitney Fish Hatchery is the largest and best-equipped fish hatchery in California and is under the jurisdiction of the State Fish and Game Commission. It has a yearly capacity of 2,000,000 fry." The first trout hatched in 1917 were from eggs collected at Rae Lakes. The eggs were transported from the collecting station at Rae Lakes via Baxter Pass by mule train to the hatchery. After the 1927 spawning season, eggs were no longer collected at Rae Lakes due to declining production. The spawning season of 1918 saw the first collection of golden trout eggs from the Cottonwood Lakes. This program continues to this day and has provided golden trout for planting throughout the Sierra Nevada This program is handled by the Mt. Whitney Fish Hatchery and is the sole source of golden trout eggs in California. Since the golden trout is the California state fish, it is obvious that Mt. Whitney Hatchery is vital to its continued success. It is also off U.S. 395 about two miles north of Independence. Fish Springs Hatchery is five miles south of Big Pine. More than 850,000 catchable size trout and over 400,000 fingerlings are raised here each year in 60 different rearing ponds. Located 4 miles south of Big Pine just off Highway 395 via Fish Springs Road. The facility is about a mile off the highway. Fish Springs Road loops back to Highway 395 almost 3 miles later. This is a safer spot to view the Elk in the Alfalfa field than trying to stop along the two-lane stretch of Highway 395, which this road parallels. The southern end of Fish Springs Road is right where the four lane passing section begins for southbound travelers at a point 7 miles south, of Big Pine where the road hits the Poverty Hills. This southern end of Fish Springs road is 17 miles north of Independence. The hatchery is open 8am till 4pm every day.